For the first Iron Craft challenge of the year, we were told to make something with cotton. That is a challenge that has pretty much limitless possiblities. I went back and forth with a few ideas and then realized this was the perfect time to do something with one of the old cotton sweaters I have laying around. 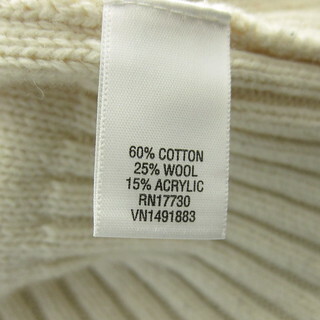 Here is the sweater I used and proof of its cotton content. It’s been sitting in my basement for over a year, so either time to use it for something or donate it. (It is slighty too small which is why I don’t wear it.) And here’s what I turned it into. 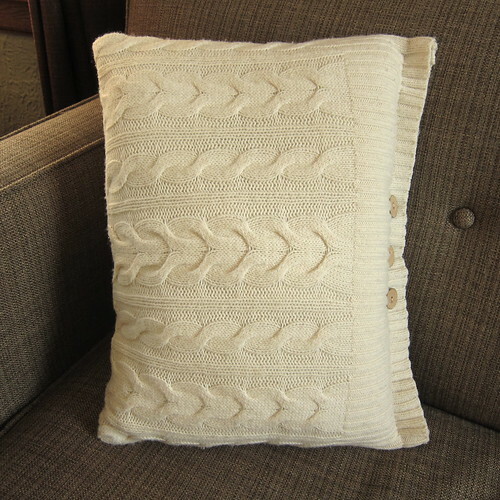 I’ve been admiring sweater pillows in some of the home decor catalogs and knew it would be really easy to make one. I think it has such a cosy feel for winter. Look how well it goes with the pillow I made for Iron Craft two years ago. 1. Wash and dry the sweater. 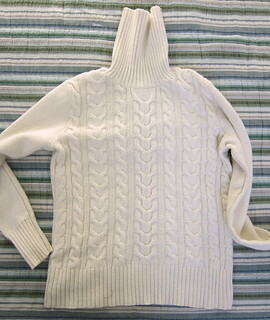 I wanted to let the sweater shrink a bit, I washed it in hot water and dried it in the dryer. 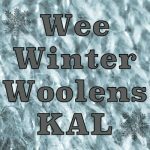 If you do this with a wool sweater it will probably felt. You make the choice whether or not to shrink your sweater. Lay the sweater out flat. 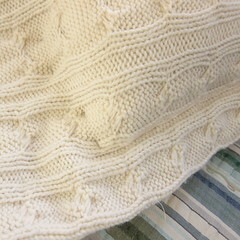 The back of the sweater will be the back of your pillow, the front your front and the waistband will be one edge. 2. 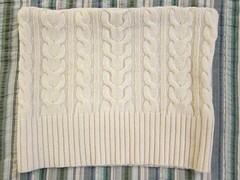 Lay the pillow insert on top of the sweater and figure out how you want the pattern to sit. 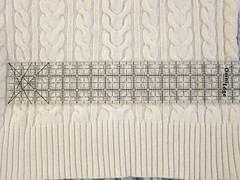 Turn the sweater inside out and pin the waistband together to keep the back and front even. 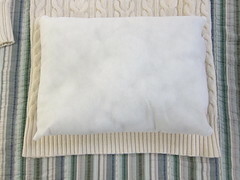 Then measure out the length of the pillow. 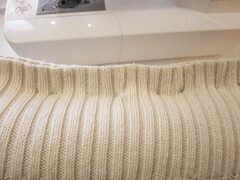 Remember the sweater will stretch a bit over the form and you want it to look stuffed, so measure a little smaller than your pillow form. My form was 16″ wide so I measured out 15″ with the large cable in the center. 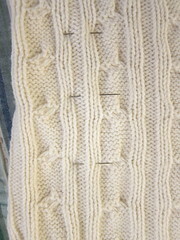 Pin along the lines you will be sewing for the sides. I found the cables on my sweater made this easy. 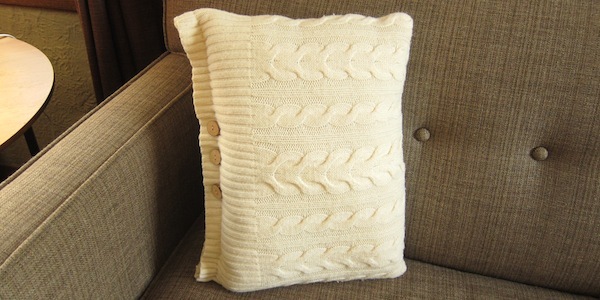 Sew along those lines about 3″ longer than your pillow is tall. I actually sewed the seams twice just for extra security. 3. Remove the pins from the cuff and insert the pillow insert. Now you will figure out where to sew the top seam. You want to leave at least 1″ of overhang at the waistband. 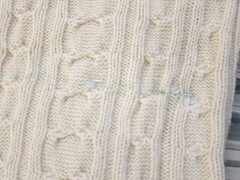 Place pins to mark that top seam. I also marked the line with a water soluble pen. Remove the insert and sew across that line. Make sure it crosses your side seams. Reinforce the corners if you wish. 4. Now cut out the pillow case you’ve just sewn. I left about 1/2″ seam allowance. Turn right side out. Insert the pillow insert and pin the waistband for the final seam. I decided to hand sew this seam, because I found it too tricky to get a nice straight line on my machine with the insert inside. Plus if I want to take the case off to wash, I can easily remove those stitches and sew them again. 5. 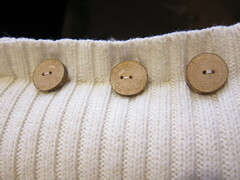 Finally, if you wish sew on buttons at the waistband. This was a great use of the wooden buttons I made last year. Such a great project. It looks as if it could be sold in any home decor store out there. Congrats on a fantastic begin to the Iron Craft season. 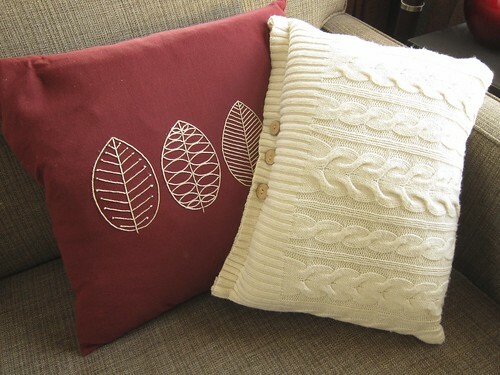 The other day I saw a pillow at Target that had that sort of embroidery that’s on your leaf pillow. I remembered your project and decided I need to try it this year. Your sweater pillow is awesome. Kat – you are so inspiring! I have been intimidated by the number and quality of entries in this week’s Iron Craft. My project was something of an experiment and only partially successful. Maybe I’ll post it later. Very cool! It turned out gorgeous. I love this and think it would look great on my couch 🙂 Nicely done again. I’m really digging on those buttons, they make the whole project!